March 24 marks the 19th anniversary of start of the NATO bombing campaign in the former Yugoslavia. Ukrainians know very little about the circumstances of those events. Information that we do have is often incomplete, often distorted, and sometimes absent at all. One of the little-known episodes is the bombing of the Radio and Television of Serbia (RTS) in April 1999. This attack was not a mistake. The RTS building in Belgrade was hit by a missile because the broadcaster was part of the propaganda machine of the then Yugoslav authorities, a weapon in the war waged by the regime of Slobodan Milosevic. Javier Solana, then secretary general of NATO, made a special press statement on March 24, 1999, in connection with the start of the air operations. In particular, he said: “In the last months, the international community has spared no efforts to achieve a negotiated solution in Kosovo. But it has not been possible. “Clear responsibility for the air strikes lies with President Milosevic who has refused to stop his violent action in Kosovo and has refused to negotiate in good faith. “The time has now come for action. “Let me reiterate: NATO is not waging war against Yugoslavia. “We have no quarrel with the people of Yugoslavia who for too long have been isolated in Europe because of the policies of their government. “Our actions are directed against the repressive policy of the Yugoslav leadership. The Operation Allied Force began without the formal consent of the UN Security Council and lasted 78 days. During that time, the North Atlantic Alliance carried out air strikes with cruise missiles and aircraft against hundreds of targets in Serbia and Montenegro. They were mostly military, industrial, and infrastructure facilities. According to various estimates, more than two and a half months of bombing killed 1,200 to 2,500 people. The total property damage is estimated at tens of billions of dollars. The operation ended with the signing of a military technical agreement in Kumanovo (Macedonia) on June 9, 1999. Three days later, the withdrawal of the FRY forces from Kosovo began. The NATO secretary general issued an order to stop the bombing on June 10, and the last missile exploded at 1:30 a.m. that day. On June 10, 1999, the UN Security Council adopted Resolution 1244, and 37,800 Kosovo Force (KFOR) troops from 36 countries were sent to Kosovo. The international peacekeeping mission in Kosovo continues to this day. One of the significant episodes of the Allied Force operation was the bombing of the RTS. 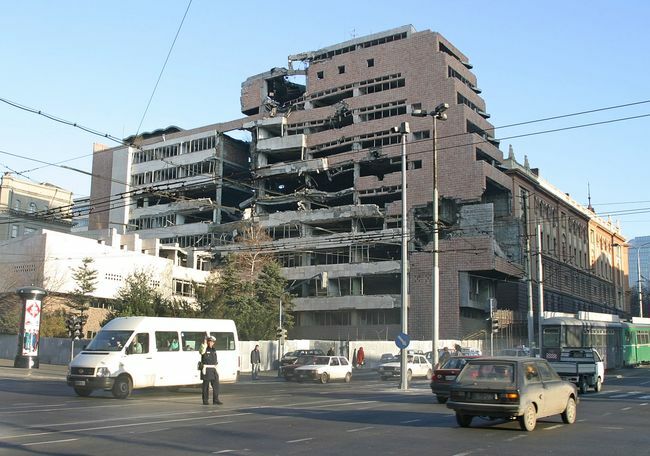 On April 23, 1999, a cruise missile launched by a NATO aircraft hit the RTS building in Belgrade. Three TV channels and four radio stations then broadcast from the home of the region’s leading broadcaster. The attack took place at night, at 2:06 a.m., just when Milosevic’s recorded interview was being broadcast on the central channel. Two of the four floors of the RTS building collapsed, the main instrument room was destroyed, 150 to 200 people (who worked the night shift or were on duty) were then present in the broadcaster’s building. As a result of the bombing, 16 RTS staff were killed, including directors, editors, programmers, cameramen, guards, a makeup artist... More people were injured, and then rescued out of the rubble of the destroyed building. Representatives of NATO and its member countries asserted that the RTS was a dual purpose object, which made an important contribution to the propaganda war being conducted then by the Yugoslav authorities. International journalist unions and TV broadcaster associations were, as expected, extremely negative about the news from Belgrade. Human rights organizations Amnesty International and Human Rights Watch (HRW), in turn, criticized the Alliance for attacking the Serbian broadcaster due to the deaths of civilians. However, the HRW cited in its report on the Kosovo crisis, posted on the official website of the organization (https://www.hrw.org/reports/2000/nato/Natbm200-01.htm#P420_111626) Paragraph 7 of the 1956 Guidelines of the International Committee of the Red Cross, which lists among legitimate military objectives “installations of broadcasting and television stations” (the source referenced by the human rights activists is ICRC, Commentary on the Additional Protocols, p. 632, para. 2002, note 3). In 2001, the European Court of Human Rights declared inadmissible for consideration of the merits a complaint lodged by relatives of several dead and wounded RTS workers against NATO members who participated in the bombing. Other international tribunals also found no grounds for opening cases against the countries participating in the Allied Force operation. In June 1999, the UN International Court of Justice refused to comply with the request of the FRY to institute proceedings against the allies. In 2000, the prosecutor of the International Criminal Tribunal for the former Yugoslavia informed the UN Security Council of his decision not to conduct an investigation into this issue. Instead, in 2002 (two years after the overthrow of the Milosevic regime), the Serbian court sentenced the former head of state radio television Serbia Dragoljub Milanovic to 10 years imprisonment because he did not ensure the safety of his employees. According to the HRW, Western media organizations that used the facilities of the Serbian broadcaster for the transfer of materials from Yugoslavia were warned by NATO representatives that the headquarters of the RTS would be attacked. As soon as Western media learned about the Alliance’s plans, the authorities of Yugoslavia also received relevant information. But as the court found, the head of the RTS deliberately did not comply with the evacuation order for TV and radio workers, although he knew that the RTS building could become a target for bombing. Dragoljub Milanovic was released in August 2012. He takes an active part in social and political life, speaks on TV and recalls the old times. He tried to sue journalists who wrote that he “sacrificed 16 employees of the RTS” in 1999. He has been unsuccessful so far: in the beginning of this year, the Supreme Court of Cassation of Serbia decided that such a value judgment was based on a court decision and did not detract from the honor and reputation of the former chief manager of the main Serbian broadcaster. As far as the RTS itself is concerned, it has... repented. On May 23, 2011, the RTS management apologized to the citizens of the country and residents of the region for the fact that in the 1990s, the RTS programs contained insults, slander, and incitement to hatred and hostility. The media company acknowledged that this was happening to discredit the political opposition in Serbia and its leaders, and was also part of propaganda of the then undemocratic regime. The RTS executives stated that programs of the broadcaster harmed honor and dignity of representatives of the political opposition, critically-minded journalists, humanist-oriented intellectuals, ethnic and religious minorities in Serbia, as well as some of the neighboring peoples and nations in the 1990s. The new RTS has pledged to be independent in its work and implement the principles of rule of law, social justice, and civic democracy, protect human rights and minority rights, and devotedly observe European principles and values. In general, today’s Serbia strives to behave in a European manner. In particular, it aims to resolve all the conflicts – including old ones, first of all, the settlement of the Kosovo situation – through negotiations and agreements. The isolated ruined buildings in the center of Belgrade, which have been specially left unaltered since 1999, remind the Serbs and should remind everyone else what happens when an authoritarian ruler wants to build a “great country” over the objections of the international community, by brainwashing people with propaganda and carrying out military aggression against other peoples.